Ah, I thought that I was going to have a respite from all things pertaining to "His Apostateness, Benedict XVI, Antipope Emeritus," well, at least for a little while as the various apostates who are Auditioning To Be The Next Universal Face of Apostasy. Such, however, is not within the Providence of God, which we must accept with equanimity and joy in all of the various circumstances of our lives. Yes, it was when I checked the Occupy Vatican Movement's website yesterday evening that I found a Pictorial Propaganda Essay In Behalf of Blasphemy and Apostasy featured in living color. One is tempted to label this propaganda display as "Joseph Ratzinger's Fantasy World of Color." Those old enough to remember Walt Disney's The Wonderful World of Color, which was the name of Walt Disney's television program when it moved from the American Broadcasting Company to the National Broadcasting Company at the beginning of the 1961-1962 television season will appreciate the reference, I am sure. Indeed, anyone who views the video of the Disney television program theme show from 1961 to 1969 (at which it was renamed The Wonderful World of Disney) might come to understand that my reference here is not merely jocular or, as is the case with some of my links, to amuse myself. No, the reference is very relevant as the renaming of the Disney program (which was titled Disneyland from 1954 to 1958 to promote the theme park in Anaheim, California, that opened on July 17, 1955, and Walt Disney Presents from 1958 to 1961) as Disney wanted to broadcast his programs in the color format in which most of them had been filmed and the National Broadcasting Company was the only network then televising in color. Officials of NBC-TV desired to produce and televise color programs in order to sell the color television sets that were manufactured by its parent corporation, the Radio Corporation of America (RCA). The late Michael Landon (Bonanza, Little House on the Prairie, Highway to Heaven) revealed decades after the fact that NBC-TV decided to produce Bonanza for one reason: to film in it in color in order to sell RCA color television sets. In like manner, the propagandists who run the Occupy Vatican Movement's website have produced a nice array of color photographs designed to show a happy, smiling, grandfatherly apostate going about his business of spreading the errors he learned so well from mentors such as the late Father Hans Urs von Balthasar. Ever proud of his blasphemy, two of the photographs show very directly the blatant nature of Joseph Ratzinger's disregard for and contempt of the binding precepts of the First Commandment. 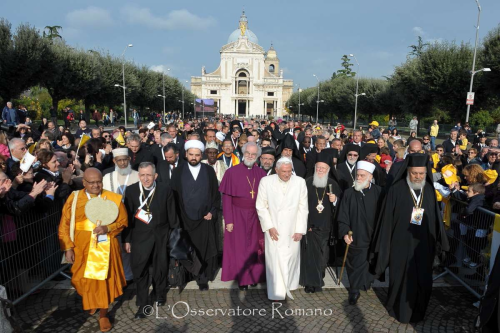 The first of those photographs, pictured above, shows the then "Pope" Benedict XVI walking along with the leaders of the other false religions of the world during Assisi III on October 27, 2011 (see Outcome Based Conciliar Math: Assisi I + Assisi II + Assisi III = A-P-O-S-T-A-S-Y). Saints gave up their lives rather than to give even the appearance of such apostasy. How can it be, therefore, that some in the "resist but recognize" movement keep contending that the now retired universal public face of apostasy attempted to "restore" Tradition in what they continue to insist is the Catholic Church when their champion blasphemed the true God of Divine Revelation so repeatedly and so shamelessly? Is God pleased with such acts of blasphemy and sacrilege? Is God to rebuild His Holy Church, she who is His spotless, virginal Mystical Spouse, on the basis of such blasphemy and sacrilege, on the admixture of truth and error? Do not such acts of blasphemy and sacrilege need to be denounced as grave offenses to the honor and majesty and glory of God? Does the gravity of such acts of blasphemy and sacrilege simply "go away" or is somewhat "canceled out" by intellectually dishonest assertions that a man who has been at war with practically every article of the Catholic Faith as It has been taught and passed down to us from Apostolic times, starting with the very nature of dogmatic truth, wanted to "restore" Tradition by means of Summorum Pontificum, July 7, 2007, even though their "suffering 'pope'" told us the motu proprio was issued solely to "pacify spirits" in order to purchase silence in the face of his many defections from the Catholic Faith? Pope Leo the Great explained the guilt of those who remain silent about and/or who seek to minimize the gravity of the grave acts of blasphemy and sacrilege committed by the likes of the conciliar "popes," including "His Apostateness, Benedict XVI, Antipope Emeritus." Among the books Pope Benedict took with him to Castel Gandolfo, only one was named: the Theological Esthetics of Hans Urs von Balthasar, the Swiss theologian who was the co-founder, with Joseph Ratzinger and Henri de Lubac, of the journal Communio. In the mid 1930s, as a Jesuit novice, the young Hans Urs was studying Scholastic theology at Fourvière, just north of Lyons. He found St Thomas Aquinas interesting enough, but what his professors seemed to have done to St Thomas was so boring that he eventually resorted to stuffing his ears during lectures in order to read something much more thrilling: the writings of St Augustine and the early Church Fathers. What had gone wrong with theology to make it so boring? Unlike many another who has found it a tedious waste of time, before and since, this particular Jesuit novice set out to discover why. In the course of answering that one simple question, he had practically to reinvent the whole subject. Theology, Balthasar believed, is supposed to be the study of the fire and light that burn at the centre of the world. Modern man has lost his grip on morality partly because the deepest reasons for being good have been systematically denied him. Throughout his writings, Balthasar very clearly describes exactly what is wrong with the world, the culture, that we have grown up with. But at the same time he states the possibility of an alternative. Later in the series, in the five-volume Theo-Drama, he employs the eyes of faith to reveal the underlying dynamic of cosmic salvation history, culminating in the inevitable "Battle of the Logos" which drives evil into the open and onto the world stage. It was a good thing, Balthasar believed, that the Church no longer wielded the temporal power that had once been claimed by the Popes, and that she had renounced forever the use of force and fear to achieve her ends. Christendom was at times a noble experiment, but it had failed to give clear expression to many of the priorities of the Gospel. The disaster of the Crusades had shown how easily even the greatest of Christians (such as St Bernard of Clairvaux) could be deceived into confusing earthly with spiritual warfare. Love is at the heart of being, and its dynamism is at the heart of knowing: it is the "code" that enables us to read the meaning of things. One more particular application of this insight might be mentioned: an application of relevance to contemporary feminism. There is always a close integration in Balthasar's thinking between seemingly abstract theological conclusions, cultural critique (thus social science) and spirituality. The tradition that God, being "pure act", could contain no trace of passivity had become associated with the tendency in Christian thought to assign a lower place to woman and to the so-called "feminine" virtues. In modern society, which increasingly values the hard, driving mechanisms of technological progress and economic competition, theology inevitably becomes entangled with the same attitude. According to Balthasar, on the other hand, to receive something from another is not at all a weakness or imperfection, but intrinsic to the nature of what it is to love. If gentleness and openness to others, or "Receptivity", is a feminine virtue, it is also an essential dimension of God. "But whenever the relationship between nature and grace is severed (as happens... where 'faith' and 'knowledge' are constructed as opposites), then the whole of worldly being falls under the dominion of 'knowledge', and the springs and forces of love immanent in the world are overpowered and finally suffocated by science, technology and cybernetics. Why is the now retired "restorer of Tradition" bringing a heretical book written by the propagator of the heresy of "universal salvation" with him to Castel Gandolfo? The answer is simple: Joseph Ratzinger has the same kind of visceral hatred of the Scholasticism of Saint Thomas Aquinas as was possessed by the late Father Hans Urs von Balthasar, who was governed by emotions and "feelings" as he engaged in a "new theology" that was simply a variation of the rationalism advanced by the Modernists at the time of Pope Saint Pius X.
Theology does not need to be "reinvented" or "updated," something that the late, nefarious revolutionary named John Raymond McGann, conciliar "bishop" of the Diocese of Rockville Centre from June 24, 1976, to January 4, 2000, told the late Father Salvatore V. Franco that he had to do ("Sal, you have to update your theology). Hans Urs von Balthasar had to "reimagine" the entirety of the Catholic Faith, and it has been the lifelong task of "His Apostateness Benedict XVI, Antipope Emeritus" to implement and institutionalize his mentor's "new theology" as the norm for Catholic theological and liturgical life and pastoral praxis. Father Regis Scanlon, O.F.M., Cap., explained in The Inflated Reputation of Hans Urs von Balthasar, that Ratzinger's mentor believed that Our Blessed Lord and Saviour Jesus Christ did not have infallible omniscience of all things in His Sacred Humanity, which makes it easy to understand how it is very easy for Joseph Ratzinger to be so dismissive of the binding pronouncements of Holy Mother Church's twenty legitimate general councils and the teaching of our true popes as he does not believe that they were guided by God the Holy Ghost infallibly given what they believe to be the "inability" of human language to express adequately in any kind of precision the beliefs of the Faith. If one were to accept Balthasar's theory that Jesus was "strictly ignorant of the hour" of His final coming, one could hardly explain how Jesus could describe the events of His final coming in Matthew 24:15-42 ("the sun will be darkened, and the moon will not give its light... they will see the Son of Man coming upon the clouds of heaven"). This is what St. Ephrem, the fourth-century Doctor of the Church, pointed out. In his Commentary on the Diatessaron he stated about Jesus: "He described the signs of his coming; how could what he has himself decided be hidden from him?" St. Ephrem said that the first reason why Our Lord did not make the time of His final coming plain, was "so all generations and ages await him eagerly" and "think that he would come again in their own day." St. Ephrem also said, "He has not made it plain for this reason especially, that no one may think that he whose power and dominion rule all numbers and times is ruled by fate and time." Thus, this opinion, that there was ignorance in Jesus, was already rejected during the fourth-century Arian heresy by Church Fathers such as St. Ephrem (and St. Ambrose). It was officially condemned by Pope Vigilius on May 14, 553, when he taught that "If anyone says that the one Jesus Christ, true Son of God and true Son of Man, was ignorant of future things, or of the day of the last judgment ... let him be anathema." (Denzinger, 29th ed., No. 419). Obviously, if the Son received into His hands "all things," including "the day of judgment," surely He also knew who would, and who would not, be saved -- even Judas! "There is no gospel text, which indicates that Christ spoke of himself as a human person, even when he frequently referred to himself as "Son of Man." This term is rich with meaning. Under the veil of biblical and messianic expression, it seems to imply that he who applies it to himself belongs to a different and higher order than that of ordinary mortals as far as the reality of his "I" is concerned. It is a term, which bears witness to his intimate awareness of his own divine identity." Although He has a fully human nature and a fully divine nature, Christ is a divine Person, not a human person. And, whatever we say about the knowledge of the Person of Jesus Christ we say about the Second Person of the Blessed Trinity. Thus, Jesus Christ had infinite knowledge "in" His human nature, but He had this knowledge from His divine Person. Jesus could experience suffering in His human nature as something new to His Person, which He had never experienced. And, surely, as Fr. John Harden says, Christ had "sense perception and derive[d] corresponding knowledge from such experience" -- i.e., "experiential knowledge" (The Catholic Catechism). Once more, the Son of God (Jesus Christ) could "conceal" some property manifested by His Person, like the manifestation of His glory or the immensity of His majesty (see Phil. 2:7, "he emptied himself), and this would account for a lack of consolation flowing to His human nature from His beatific vision. But He could not give up something intrinsic to His divine Person or His divine Being. And God's self-knowledge is intrinsic to His divine Being, for St. Thomas Aquinas says that, "God understands Himself through Himself." And, he says: "the act of God's intellect is His substance" and "His act of understanding must be His essence and His existence" (Summa Theologica, 1a, q. 14, art. 2). Yes, you see, Holy Mother Church has never been ignorant of anything, which is why Joseph Ratzinger's contention that "we had to learn" about that doctrinal pronouncements become "obsolete in the particulars they contain," an integral part of his philosophically absurd and dogmatically condemned "hermeneutic of continuity," is heretical and blasphemous on its face. Yet it is that the conciliar "'pope' emeritus" persists in his unending adoration of the cult of his mentor, Hans Urs von Balthasar, right to the point of taking one of his fellow heretic's books with him into retirement. A man who was a seminarian with Ratzinger in Germany reported in 2005 after the "election" of his friend to the conciliar "pontificate" that he was with Ratzinger when one of their seminary professors read Humani Generis, prompting him to walk, seminarians in tow, to his room, whereby he slammed his books on the floor in disgust. The former seminarian said that that had made quite an impression upon the young Joseph Ratzinger, who has been unfailingly faithful to one condemned Modernist proposition after another. Ah, yes, the "great restorer of Tradition." How could I forget? Well, it's easy to forget as the pages of history will slam shut on this blasphemer and apostate once Christ the King sees fit to restore His Holy Church as the fruit of the Triumph of the Immaculate Heart of Mary. We must not forget to have nothing to with the lords of conciliarism as we pray fervently for their conversion. We must not forget to do penance for our own sins, accepting with joy, equanimity and gratitude to the good God for all sufferings and humiliations that are visited upon us by those of our relatives, friends and acquaintances who think that we are outside of the Church. The intentions of all hearts and the circumstances of all lives will be revealed only on the Last Day at the General Judgment of the living and the dead. It is good to suffer for the sake of the Holy Faith. What a wonderful gift we have been given during this Lenten season to suffer all manner of calumny for rejecting the counterfeit church of conciliarism and the condemned propositions advanced and blasphemous, sacrilegious actions of its lords. We must fly unto Our Lady through her Most Holy Rosary every day as we seek to keep her Divine Son company before His Real Presence in the Most Blessed Sacrament, which is very difficult for most Catholics in the world to do today given the sacramental barrenness of conciliarism. Remember, this is the time that God had appointed for us from all eternity to live.